Volvo has expanded its Cross Country range with a high-riding version of the S60, offered a choice of front-wheel or all-wheel drive. This curious new take on the crossover class got its global debut at the Geneva Motor Show and is due to go on sale in summer, with a likely cost of around £30,000 in entry-level form. 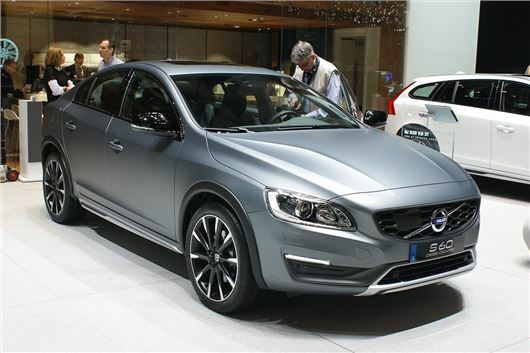 The S60 Cross Country rides noticeably higher than a standard S60 and is differentiated by unique bumpers and side skirts. The wheels are either 18- or 19-inch and come on high profile tyres. Paired with the higher suspension these should improve ride comfort and reduce noise. Initially the S60 Cross Country will be offered with front wheel drive only, powered by a 190PS 2.5-litre D4 diesel engine. An all-wheel drive variant will come later, powered by the same engine.